A few weeks ago, I was lucky enough to attend the Max Global Experience: Uganda – a meeting of patient leaders, Max team members, and Max partners working to expand access to cancer treatment in Africa. The experience was a great success and had many highlights. Erin Schwartz, Dr. Jackson Orem, Dr. Diana Atwine, and Pat Garcia-Gonzalez at the symposium. 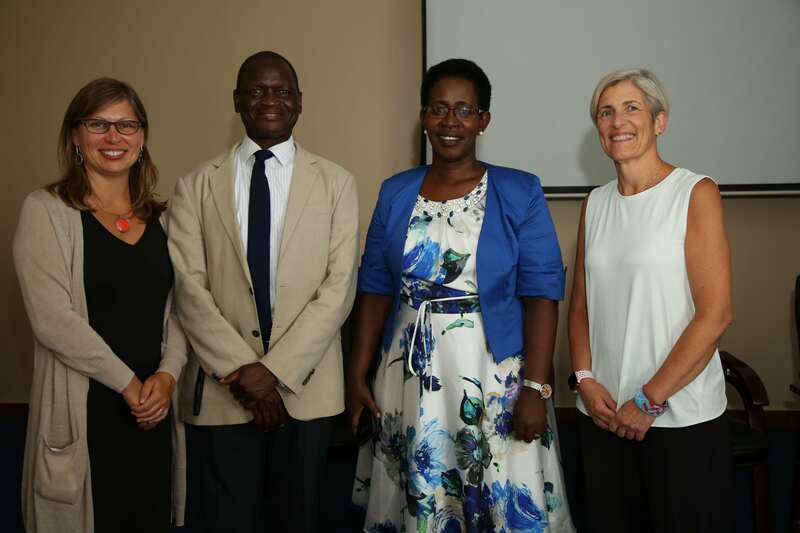 We held an all-day symposium that featured presentations by Dr. Jackson Orem, the esteemed Director of the Uganda Cancer Institute, Dr. Diana Atwine, the Permanent Secretary to the Ministry of Health in Uganda, and panel discussions with hematologists and patient leaders from across Africa. It was an incredible opportunity for patients and providers to be heard by decision-makers and influencers from pharmaceutical, governmental, and diagnostic organizations. Patient leaders, Max partners, and Max team members walk the “last mile” along the Nile. We visited the source of the Nile river where patient leaders, Max partners, and Max team members walked the “last mile” in solidarity with patients across Africa who undergo their own journeys to access treatment. Then we all recommitted ourselves to the cause of expanding access by releasing personal messages (written in non-toxic ink and on water-soluble rice paper, of course) into the Nile river to be carried across Africa. The Max Global Experience visits the Uganda Cancer Institute. The experience concluded with a visit to the Uganda Cancer Institute (UCI), where we toured the clinical and research facilities and engaged in a group ideation session about the future of cancer care in our host country with Drs. Jackson Orem and Nixon Niyanzima of UCI, Jerry Radich and Hootie Warren of Fred Hutch, and Michael Bates of Cepheid. Though these experiences stand out as highlights (and you can see wonderful photos of them here), the moments that really meant the most to me – the ones that still cross my mind on a daily basis – all took place on two hardback chairs in a stuffy hotel conference room. Over the course of the Max Global Experience, we were also conducting interviews. One-by-one a poet, an engineer, a priest, and a programmer, all found their way into the conference room and to the seat opposite mine. They were also mothers, fathers, spouses, and friends. In our shared context, and many others, they might only be thought of as patients. But that is the privilege of an interview. It allows you to witness the person in front of you as they actually are, not as society assumes or expects they might be. Bahija, a mother, poet, and patient leader from Morocco. Gershon, a father, engineer, and patient leader from Ghana. It allows you to understand that, though he has many responsibilities as a business owner, community leader, and patient advocate, Gershon is a father first, before he is anything else; that the two young men he’s been referring to as his “sons” are actually the children of a friend who passed away. He now looks after them. Never mind that he already has children of his own. Never mind that he has cancer. Trevor, a father, priest, and patient leader from South Africa. It allows you to appreciate the nobility of someone like Trevor; how for years and years and years, he remained a pillar of strength for his wife, his children, and his congregation, all while shouldering the impossible loneliness of being diagnosed with a cancer that – at the time – no one else seemed to have and no one knew how to treat. To know, to understand, and to appreciate another person’s humanity: that is the privilege of an interview. And, for me, that was the privilege of attending the Max Global Experience: Uganda.